HAMLET — What do you do for your welding class project? Build yourself some new wheels! That is exactly what two Richmond Community College students did this semester. 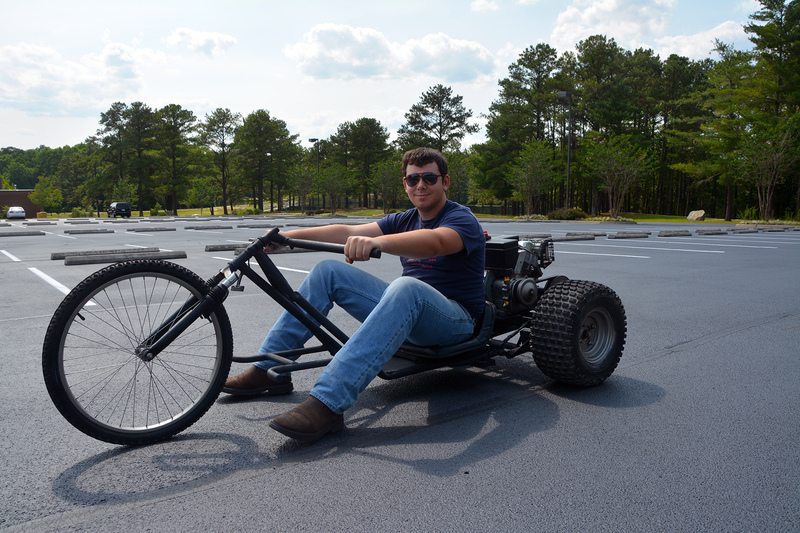 Travis Butler and Jason Felts used bicycle, lawn mower, go-cart and other scrap parts to build a trike. Richmond Community College student Travis Butler sits on the trike that he and his classmate, Jason Felts, built in their welding class. They built the motorized trike using bicycle, lawn mower, go-cart and other scrap parts. The three-wheel motorized bike has go-cart tires in the rear and a bicycle tire in the front, a handbrake and a throttle. The students – and their instructor and some staff members – recently took it for a test drive in one of the parking lots on campus. “I have to say I was surprised how well it rides,” said RCC welding instructor Chris Cesaro, who also added that Butler and Felts would be getting an A+ on the class project. Butler and Felts are in RCC’s Welding Technology diploma program. They put in 64 hours building the trike over the course of four weeks. RCC offers both a diploma and certificate program in welding. Students learn cutting processes, stick, mig and tig welding in a state-of-the-art, 15-booth welding lab. Because of the success with the trike, Cesaro said he plans to have his welding students build a motorcycle. RCC will have registration for fall classes for new students July 9 from 2:30 to 5:45 p.m. on the main campus in Hamlet. Students will meet with an advisor and build their class schedule for fall semester. Fall classes begin Aug. 17. Applications can be filled out online at www.richmondcc.edu. For more information about RCC, call 910-410-1700.